"15. Integrative encounters in primary care - Integrative encounters address all dimensions of health by bringing the knowledge of conventional, unconventional, complementary, alternative, traditional and integrative medicine disciplines to bear across the many different cultural traditions of persons cared for." The "forecast area" is among 18 preliminary fields of interest including such areas as changes in technology, science, personalized medicine, community medicine, and knowledge of determinants of health. The study is led by IAF founder and board chair Clement Bezold, PhD, an Integrator adviser. It is funded by the Kresge Foundation. On April 19, 2011, as part of Bezold's wide-ranging research, he participated in a discussion with members of the Board of Directors of the Academic Consortium of Complementary and Alternative Health Care (ACCAHC). Bezold noted that the CAM/IM components take two forms. One is a forecast on the role of individual "CAM" therapies as integrative components of conventional primary care treatment. The other is the role of licensed "CAM" professionals as primary care providers. For more information about the forecasts and how to participate, click here. For comments from some integrative practitioners, click here. Comment: In 1978, Bezold's organization held a briefing inside a U.S. House of Representatives office building for members of Congress. He forecast that something called "alternative medicine" would have a growing role in US health care. The spot-on nature of that forecast makes the outcomes of this initiative especially fascinating. Alignment of interest note: ACCAHC has a major project on primary care which Michael Goldstein, PhD, UCLA interim vice provost and dean of the graduate division, and I are co-leading. Work on cementing relationships and "changing the culture" among the 17 federal departments. Determine how best to bring integrative practice into the plan, including bringing outsiders in to help define its proper role. Says Walsh: "(The second) seems to be loaded with possibility. It gives this advisory group the role of injecting 'integrative' into the prevention plan, and thus into the consciousness of the public health community which will be the agent for carrying out whatever programs make it through the cutback wringer." Walsh noted that Kerr and van Horn made comments relative to the Council's charge to embrace "integrative healthcare." Janet Kahn, PhD, representing the Integrated Healthcare Policy Consortium also did, as dis Walsh himself, in his own testimony. Comment: This does appear to be a remarkable opportunity for input. i know that, besides Walsh and IHPC, the Samueli Institute also had representatives there. Hopefully there is follow up so that the "possibility" Walsh identifies is being seized. Integrative medicine doctor Richard "Rick" McKinney, MD shares the resource website Integrative Medicine for the Underserved. McKinney, who works with the UCSF Osher Center and with the family medicine residency at San Francisco General Hospital, hosts monthly phone meetings on the topic. Participants are typically academic integrative medicine doctors from across the US and Canada. Minutes of past meetings are posted on the site. Also available as a public service are a "toolkit" for patients and educators and even "dot phrases to use in (electronic medical records)." Comment: Two organizations working on parallel paths are the Center for Integrative Medicine in Public Health (CIMPH), founded by naturopathic physicians in Oregon, and the Network of Researchers in the Public Health for Complementary and Alternative Medicine (NORPHCAM), an international effort founded in Australia. Here's to useful collaboration, particularly in the public health arena where $1 typically needs to serve as $5. 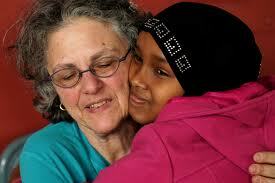 The article in the Seattle Times April 10, 201 is entitled For Somali Women, health program eases the pain of war, exile. The writer immediately points out that the program, led by Bria Chakofsky-Lewy, RN, focused not on pills but on massage. Seattle-area massage students provide the services. The group later added yoga, via a Jane Fonda tape. According to the article, Chakovsky-Lewy's care group at Harborview Medical Center "tries to deliver 'culturally competent care.'" This is "health care sensitive to the diverse cultural backgrounds of patients, many of whom are unfamiliar with Western medicine." The program, called Daryel or "wellness" in Somali, is apparently a hit. At least 6783 community acupuncture treatments were provided in 2010, probably closer to 10,000. Where there was 1 clinic in 2002, 102 community acupuncture clinics are operating in 2010. Some 353,000 community acupuncture treatments were provided through the 102 clinics in 2010. Revenues from the clinics were $6-million to $7-million dollars in 2010. Rohleder presents these data in the context of a quantum shift in acupuncture practice from seeing patients one at a time to gaining comfort in a room full of patients. She estimates that if the acupuncture profession engaged this quantum shift, the number of patients served by acupuncture will swell from 3-million a year to 20-million and then many more. She states: "If you had more than 20 million people getting acupuncture a year, we would start to see some real momentum. The more people get acupuncture, the more people get acupuncture." Comment: The controversial Rohleder is continuously one of the most brilliant, outspoken, free-thinking, insightful and real-world based writers and thinkers in the integrative practice community. While her focus is on the field of AOM and community acupuncture, her words will resonate with many other forms of integrative practice. It's a long post. Jump down through it. Toward the end you will encounter a new concept CAN is embracing called "multi-stakeholder cooperatives." She identified the new People's Organization of Community Acupuncture (POCA) as a partner organization that will facilitate this development for the CAN field. In a April 27, 2011 release, the American Massage Therapy Association (AMTA) announced a collaboration with the Penny George Institute for Health and Healing in an analysis of more than 13,000 inpatients who received integrative therapies. AMTA President Glenath Moyle called it "the first major achievement toward our research and industry relations goals this year." Massage is the most common integrative therapy at Abbott Northwestern Hospital where the George Institute is housed. Principal investigator Jeffery Dusek, PhD will also examine records of 2400 patients who did not use integrative care. Dusek describes the wide-ranging study this way: "We propose to document predictors of integrative therapy referrals, service delivery and therapy selection for pain management ... We will also examine the impact of integrated therapies, specifically therapeutic massage, as adjuncts to traditional interventions on short changes in pain in an acute care hospital setting." The team believes the study will be "the first comprehensive evidence on the effectiveness of therapeutic massage therapy in a 'real-world' inpatient setting." Comment: Good for AMTA. And credit the Penny George team for having created the program allows this kind of analysis. A note: The Institute will offer its Hospital Based Integrative Health Care Conference: Transforming Health Care Practice Aug. 3 - 5 and The Hospital Setting: Integrative Health Practitioner Training for Massage Therapists June 27- July 1, and The Hospital Setting: Integrative Health Practitioner Training for Oriental Medicine Professionals Aug. 15 - 19. The Center for Health Transformation (CHT) recently brought its "hospital transformation tour" to Western Regional Medical Center where Cancer Treatment Centers of America (CTCA) hosted the group's quarterly meeting. In comments, CHT founder and presidential hopeful Newt Gingrich described CTCA as "one of the most creative members of the Center . . . Cancer Treatment Centers of America, who have really focused on delivering a human-centered model of care . . . to bring a better chance for survival and better quality of life." The tour is meant to promote "hospital transformation tour" presents the nation's most innovative, patient-centered hospital models. The day-long event was entitled "Igniting a Social Movement to Create a Personalized Health System." The goal, according to CTCA, was "on activating and encouraging collaboration among private sector health leaders to return the voice of the consumer to the center of our nation's health reform dialogue." Gingrich's speech is posted here. A speech by CTCA's CEO Steve Bonner is here. North Dakota became the 16th state to license naturopathic doctors after a unanimous November 14, 2011 vote in the state's upper chamber and an 80 to 10 vote in the House. According to a report to members from the American Association of Naturopathic Physicians, the bill, signed April 26, 2011, creates an integrative health board that "will serve as an incubator for small groups of health-care professionals seeking licensure, but whose size would not support boards of their own." Credit is given to Beth Allen, ND, for leading the effort. State Senators Margaret Sitte (R) and Senator Tim Mathern (D) were cited for working "hand-in-hand in building a bipartisan coalition to push this legislation through." The law is not as broad as in more mature states,.The doctors have no prescriptive rights and it appears the chiropractors kept the NDs from spinal manipulation. In a Facebook site for the associaiton, Allen explains: "We can diagnose & treat. We can do physical exams & lab tests, including phlebotomy. We can treat using our 5 major natura...l treatment modalities: nutriiton/supplements, herbs, homeopathy, education/counseling and physical mediicne. The only restriction on physical medicine is spinal manipulation. We cannot prescribe drugs or do surgery. We can prescribe prescriptive devices." A story from the AANP is here. Comment: I am sure the ND profession would like to have picked up a big state like New York or Massachusetts or Illinois where efforts have been underway for years. Still,16 is a better number than 15 and 20 is on the horizon. According to a bulletin to interested parties from Barbara Brandt, PhD, the organization's first chair, the American Interprofessional Health Collaborative has incorporated. AIHC "offers a venue for colleagues across health professions to share information, mentor and support one another as they provide the leadership to influence system change with the implementation of interprofessional education and practice at their individual institutions and within organizations." AIHC's case statement is called "Transcending Boundaries: Transforming Learning." (Contact me if you would like to see it.) . Comment: As noted in 8 Major Trends Promoting Integration of Integrative Practices and CAM Disciplines, the movement for IPE, and the establishment of AIHC, are exceptionally hopefully developments. Might there be more ease in integrating non-conventional practitioners among academics and clinicians already propounding affirmatively opening of their peripheral visions to others? IPE may just be the connective tissue. The movement can help weave the fabric across the chasm that still separates the so-called "CAM" disciplines and the rest of allied health. Those interested might plan to attend the AIHC's November 19-21, 2011 conference in Tucson. An unusual collaboration between educators from 6 disciplines will hold a "historic event" on May 10, 2011 when they release, at the National Press Club, a collaboratively developed document entitled Core Competencies for Interprofessional Collaborative Practice. The document was developed, according to Barbara Brandt, PhD, chair of the American Interprofessional Healthcare Collaborative (see article above), by "an expert panel appointed by the Interprofessional Education Collaborative (IPEC)." IPEC consists of the American Association of Colleges of Nursing (AACN), the American Association of Colleges of Osteopathic Medicine (AACOM), the American Association of Colleges of Pharmacy (AACP), the Association of American Medical Colleges (AAMC), the American Dental Education Association (ADEA), and the Association of Schools of Public Health (ASPH). IPEC was formed in 2009. Comment: The force behind this document is clear in the make-up of the entities that helped keep bring these disciplines to the table. They will also be present at the May 10 announcement. Included are the Health Resources and Services Administration (HRSA) led by Mary Wakefield, RN, PhD, Robert Wood Johnson Foundation, the Josiah Macy, Jr. Foundation, and the American Board of Internal Medicine Foundation. Together these also hosted a February 2011 meeting in which the competencies "were examined and action plans were developed to support them." Amidst all of the negative news in health care, this initiative is a bright light. Now, to open the work to other disciplines. The 7th annual oncology training for "CAM" practitioners will be offered by MD Anderson July 27-29, 2011. According to this PDF brochure, the course "provides licensed acupuncturists, licensed massage therapists, and trained yoga teachers an overview of evidence-based practices in cancer care." Topics include recent research findings, recommendations for treating common side-effects, ethical issues, safety issues and case presentations will be presented. Note: The Penny George Institute/Allina Hospitals and Clinics will offer its Hospital Based Integrative Health Care Conference: Transforming Health Care Practice Aug. 3-5; The Hospital Setting: Integrative Health Practitioner Training for Massage Therapists June 27-July 1; and The Hospital Setting: Integrative Health Practitioner Training for Oriental Medicine Professionals Aug. 15-19. The Alliance for Massage Therapy Education (AfMTE) and Federation of State Massage Therapy Boards (FSMTB) are linking to develop a national continuing education approval program, according to a release for AfMTE. The program will ultimately include review of both courses and providers. AfMTE is "excited about bringing the education and regulatory communities together to build a strong and consistent quality assurance program." The release notes that a November 2010 survey conducted by AfMTE on educational standards, 53.5% of respondents agreed that such an approval program was needed. Just 25.6% disagreed. Comment: With the exception of chiropractic, the last 25 years have witnessed virtually all of the national organizational development in the "CAM" fields. The massage field has had a hole relative to an organization by and for educators and schools. AfMTE's stepwise move into filling this role has been remarkable. Witness the movement here from a Fall 2010 survey report to April 2011 project with the licensing board that is supported by the survey findings. AfMTE showed a smart sequence by first developing evidence and then acting. They also have the right partner. Here's hoping that the the massage field, which doesn't have agreement if it is a profession or a trade, will realize what a great engine that could AfMTE is beginning to be. If the educators and schools start forking over dues, an if the American Massage Therapy Association and Associated Bodywork and Massage Professionals weigh in with support, this obstacle to massage's maturation in health care may be removed. AfMTE member rolls will grow and the organization's ability to act will be empowered. After seating its board just 10 months ago, AfMTE is off to a very good start. Explore the latest developments in CAM modalities and the research being conducted to prove its efficacy. Establish an ongoing dialogue regarding innovative system change efforts to integrate wellness into conventional care. The founding meeting included a breakout session on integrative medicine's impact on health disparities. According to the GiH site, "these sessions led to dynamic conversations about philanthropy's role in shaping a future health care delivery system that integrates CAM into conventional care settings." The site includes a variety of educational resources for funders. Comment: As a person who both reports and also seeks to connect with funders under my not-for-profit hat with the Academic Consortium for Complementary and Alternative Health Care, I typically find myself engaged in an internal conversation about whether my self-interest might be better aligned with not reporting events such as this. My higher, if less practical, self usually takes a couple of punches before winning out. Italian integrative medicine leader Paolo Roberti di Sarsina, MD sends notice of the March 2011 meeting of CAMbrella, a "pan-European research network for complementary and alternative medicine (CAM)." CAMbrella involve 16 partner institutions from 12 European countries. Their focus is on "developing a road-map for future European research in CAM that is appropriate for the health care needs of European citizens and acceptable to the EU Parliament as well as national research funders and health care providers." Roberti di Sarsina hosted this meeting. It followed a January 2010 gathering when the initiative was created via the Eureopean Commission's Seventh Framework Programme. An informational report and photos from the meeting are here. Comment: Via Roberti di Sarsina I am reminded, through articles and links he regularly sends, that integrative healthcare is indeed an international movement. CAMbrella is the point of the spear in Europe. Unintended consequences of herb regulation? Herbal medicine regulation enforcement arrives in the UK: Will it stimulate a black market? "Patients who use herbal remedies will not have access to treatments if the products have not been authorised, which might encourage them to purchase the products from alternative, less well-regulated sources. Herbal practitioners will find their legitimate pharmacopoeia limited." The date stems from an action taken on March 31, 2004 when the European Parliament and Council adopted the Traditional Herbal Medicinal Products Directive. The Directive required that, within 7 years, all herbal medicinal products must meet standards and be registered if marketed. Thus far 211 applications have been received and 101 granted. The editorial notes that no applications from China have been granted, significantly impacting access to such agents. Comment: This may be the Herbal Black Market Expansion Act of 2011. The editorial was right to note that patients and practitioners are likely to "purchase the products from alternative, less well-regulated sources." While I like to know products I chose meet quality standards (and I do know that there are opportunist scoundrels in the herb industry), one necessarily wonders about the politics of herb regulations. The Lancet notes that UK regulators receive 70 complaints a year about adverse effects from herbs. A loose estimate based on data from recent publications suggests that 70 is probably less than the number of hospital errors from conventional procedures in a given hospital in a given day. (That is, if inpatient care in the UK reflects that in the US.) The main beneficiary of the regulation may not be public protection, as The Lancet states. The beneficiary will be illegal herb trade in the UK. An unintended consequence of the regulations may be an increase in adverse events due to herbs. Actuary Heather McLeod shares that New Zealand Centre for Evidence‐based Research into Complementary and Alternative Medicine (ENZCAM) has commenced a series of CAM/IM/traditional medicine newsletters. McLeod will produce these as a first evidence of a new relationship on a "series of projects" with Ray Kirk, PhD at the University of Canterbury in Christchurch, New Zealand. The newsletter will include "a section on the integration of CAM into clinical practice and health systems." The newsletter material on practitioners and conferences will have an Australasian and Pacific focus. McLeod runs a resource and consulting site called Integrated Healing. Reed Phillips, DC, PhD, is president emeritus of Southern California University of Health Sciences and an acknowledged leader in advancing research, education, collaboration and accreditation in the chiropractic and "CAM" fields. Phillips is currently in a short term position at the Durban University of Technology (DUT) in South Africa at the faculty of Chiropractic and Somatology. Said Phillips: "They have a great (chiropractic) program going down here. It is well integrated into the university and is well respected." The university has 25,000 student and 8 health sciences programs. These are side-by-side with many more degree offerings. Phillips notes that South Africa's other chiropractic program is similarly lodged in the University of Johannesburg. There, chiropractic is one of 12 health services programs. Adds Phillips: "Durban University of Technology has an enrollment near 25,000 and services predominantly the African and Indian populations. Very interesting cultural mix." The health professions programs at these universities range from nursing to optometry on one hand, to Sports and Movement Studies and Homeopathy on the other. No education of medical doctors, apparently. Comment: Can there be 'CAM" discipline integration in practice without CAM discipline integration into health sciences education? The history of CAM program exclusion from conventional academic health centers in the United States is home to roost with the rise of the movement for interprofessional education (IPE), noted elsewhere in this Round-up. IPE is best taught, and perhaps necessarily taught, in clinical settings. This is tough to accomplish when the disciplines don't cohabit the same academic and clinical settings. The absolute silos of stand alone CAM schools create integration challenges. Meantime, it's fascinating to think of all of these 8 or 12 non-MD disciplines getting to know each other without the paternal presence of an MD educational program. What does that medium breed? Perhaps nothing more, or less that\n, as Phillips puts it, the programs being "well integrated into the university and is well respected." A pretty thing to think about, for now, in the U.S.
Medcal Schools Embrace Alternative Medicine. So reads the headline in the April 12, 2011 US News feature. Given 2nd paragraph visibility is the Institute for Functional Medicine (IFM). IFM's executive director Laurie Hofman, MPH states that interest in teaching alternative approaches "has exploded, especially this last year." The US News writer points to time constraints that limit integration of new content. She adds that the University of Arizona "will launch a 16-hour Internet-based holistic course on prevention and wellness, open to medical students from other schools." In addition, "IFM will debut Web-based modules later this year on gastrointestinal health, the principles of functional medicine, and nutrition." The writer then adds this aside: "Time constraints are no doubt the reason a recent study in Academic Medicine found that only 27 percent of medical schools currently meet the minimum target, set by the National Academy of Sciences, of 25 hours for class time about nutrition." Comment: So, after a century of reports urging medical schools to beter value the role of nutrition in health, only 27% meet what is certainly, from an evidence perspective, less than minimum standard. These same institutions "embrace alternative medicine"? I don't think so. Of course there are inroads. IFM and ACIM are cutting many. This article begs a key question: What does it feels like to embrace a porcupine, even one in velvet gloved needles? Comment: I don't typically cover courses such as this but felt that this is probably filling a gap in the education of many practitioners. Joel Kreisberg, DC sends notice of "an online continuing educational program designed to deliver high-quality curricula for medical professionals to help reduce the presence of unused pharmaceuticals in households and the environment." The program is offered by GreenPharmEdu and offers three hours of unique curricula for physicians. The program is available free of charge for everyone. Continuing education credits are available for a nominal cost of $25. Marketing materials note that Ilene Ruhoy, MD, co-author of the firm states: "Concerns regarding pharmaceutical use are traditionally viewed as ending with the patient whether the symptoms improve, persist or deteriorate. Unfortunately, the unintentional results of a single prescription may have serious impacts on the health of children and teens." Dr. Ruhoy argues "All primary care physicians should gain a basic knowledge of the risks and the solutions. An experienced integrative MD/DO to join our clinic and be part of our rapidly expanding program assistant/associate professor level. Program offerings include nutrient infusions, active nutrition services with a teaching kitchen under the direction of an integrative nutritionist, neurofeedback, and a variety of laboratory testing options to guide recommendations. Applicants for the Program in Integrative Medicine fellowship year beginning in August 2011 through July 2012. The is open to MD/DO physicians who have completed a primary care fellowship and are board certified or board eligible. A certificate from the University of Kansas Medical Center is awarded upon successful completion and a stipend is available for the year. The closing date for receiving applications is May 30, 2011 with the announcement of the selection in the beginning of June. When Modern Healthcare published it's annual list of the Top 25 Women in Healthcare on April 18, 2011, integrative medicine leader Tracy Gaudet, MD, was on the list. Back in 1996, Gaudet helped create what is now the Arizona Center for Integrative Medicine. She then directed the Duke integrative medicine program. The post that certainly earned her Modern Healthcare's recognition is her present one. Gaudet heads the new Office of Patient-Centered Care and Cultural Transformation for the Veteran's Administration. The award is funded through the Furst Group. Gaudet was one of 18 women selected in 2011 for the first time. Comment: Here is a fun sequence about community and happenstance and intention that was linked to Gaudet's selection, if not actually causal. Step 1: While interviewing Bravewell philanthropist Ruth Westreich for this Integrator article, Westreich told me of Gaudet's VA appointment. Step 2: I subsequently wrote Gaudet's position up in the February 2011 Integrator Round-up. Step 3: Within a week, I heard of Modern Healthcare's call for nominees and quickly but informally nominated Gaudet by sending in my Integrator brief on her to the magazine. Step 4: I suggested to a longtime colleague, Bonnie Horrigan, communications director for the Bravewell Collaborative, with whom I was in contacvt on another matter that they, or Duke, might formally nominate Gaudet. Besides, the Duke program has been substantially funded by Christy Mack, the current Bravewell president. Step 6: Either before or after my note, what was probably a much more impactful nomination went in. Why these steps, other than to bask in maybe having had a hand in this naming? Those who know the actual Rosa Parks story will see a parallel. As author Paul Loeb related in Soul of a Citzen, more than a personal, momentary whim from some nice black lady led to Rosa Parks' action on that bus, that day. Parks had spent 12 years working on civil rights with the local NAACP chapter. She was working within a community of activists. Just so, Gaudet's recognition as one of the Top 25 speaks to the influence of a community of interests (that, for instance, sometimes read the Integrator). The honor of course also speaks to the contributions of Gaudet, which have been many. 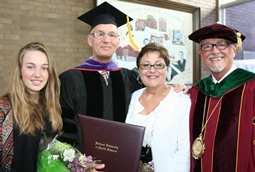 At the April 21, 2011 graduation ceremonies of the National University of Health Sciences (NUHS), president James Winterstein, DC and the NUHS Board of Trustees granted Integrator publish-editor John Weeks "the honorary degree of Doctor of Laws, LL.D. (honoris causa)." The ceremony followed a commencement talk Weeks delivered for the graduating chiropractic, naturopathic and acupuncture and Oriental medicine students. Weeks was recognized for his work with the Integrator and with other media. He was also cited as an organizer and director of the National Education Dialogue to Advance Integrated Health Care and of the Academic Consortium for Complementary and Alternative Health Care. NUHS's summary citation called Weeks "a key individual in the movement of the integration of alternative and complementary medicine with allopathic and osteopathic medicine." Alignment of interest note: The honoree is related to the present writer.